And with that trend likely to continue growing at an exponential rate, many business owners are realizing that their websites need to look as good—and work as well—from devices like iPads, as they do from traditional desktop computers. 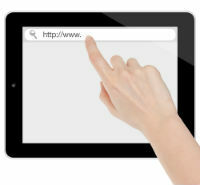 So what’s the best way to make sure that you have an iPad-optimized website? Here are some tips on how to check if you already have an iPad-friendly website, and if you don’t, you’ll find out how to update your existing site to ensure capability with mobile technology. Before getting started building a brand-new mobile-friendly site, it’s probably a good idea to first find out if you even need to do so. To find out if your website is already iPad-compatible, enter your site’s Web address in this Mobile-Friendly Test provided by Google. If your site doesn’t pass the test, it’s time to consider your options to achieve compatibility. So Your Site’s Not Mobile Friendly. Now What? Google provides a wealth of information for webmasters interested in updating their sites to achieve mobile compatibility. One invaluable source of knowledge is their Webmasters Mobile Guide, which covers all the bases about creating and updating sites to ensure that they play well with devices of all shapes and sizes. Weebly, review Google’s documentation and check to see if mobile-compatibility is simply a matter of changing an option or switching to a different iPad website template that’s optimized for mobile devices. If your CMS offers mobile-friendly templates, it could just be a matter of switching to a different theme, rather than having to rebuild your site from scratch. Absent or Incompatible Website? Not a Problem. To make certain that your website is 100% compatible with mobile devices, it’s important to remove all elements of your site that were created using Flash technology, which is not supported by most mobile devices, including all of those made by Apple. If your business doesn’t presently have a website, or if it’s due for an overhaul, you may wish to use an iPad website builder, such as Simpl, Simple Different, or any number of other website builders that actually let you create iPad-friendly websites right from an iPad. There’s also no shortage of mobile website-builder software programs that are designed specifically to help you build a mobile-friendly websites. Once you’ve updated your existing site, or created a new one using a website builder for iPad, it’s time to get ready for increased traffic. Google recently started making it easier to find mobile-friendly websites while searching from mobile devices, to help users on the go find what they’re looking for faster. Learn more about mobile website builder software .